What an amazing year it has been for the NFB. It’s been exactly one year since we launched the NFB Screening Room – we wanted to make the NFB more accessible to Canadians and the world and the response has been overwhelming and exceeded our expectations in every way. Since the beginning, our philosophy has been to try to be open, transparent and accessible wherever we could. Not only does that mean making our films free to the public – but it also means opening the way we work. Using open source software, sharing code that we develop and participating in conversation wherever you want to participate. Part of this “opening the NFB”, also means sharing our statistics. We want filmmakers (and the film industry in general) and the Canadian public to see these stats and possibly benefit from them. 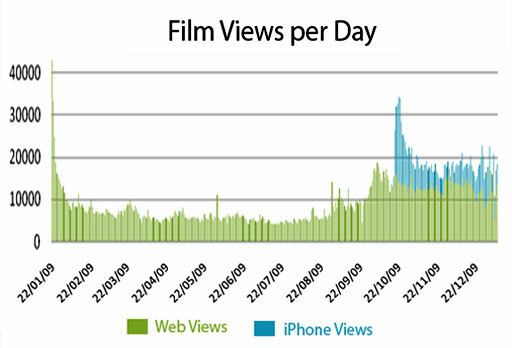 * We grew from an average of 3,000 film views per day (Jan ’09) to over 20,000 film views per day (Jan ’10). * Our content library grew by nearly 1000 videos this year – from 500 films, clips and trailers when we launched to nearly 1500 today. The 10 most popular films on the site this year (Note the running times for each film). Our community had a lot to say in 2009 – and we took part in the conversation wherever we could. * We have about 3,500 “fans” on Facebook. * We have 19,000 subscribers to our YouTube channel. This is THE most awesome app. The NFB has done a great job and have updated with items that users have requested – more than I can say for some apps that I paid for! It is amazing how you can feel like a kid with some of the classics – Log Drivers Waltz always puts a smile on my face. Finally my tax dollars well spent. Keep it up NFB! Thank you Canada for a great year! We hope you find these stats useful or interesting. If you have any comments or questions about other stats, please let us know in the comments below! Thanks for sharing your thoughts on motivasi.world. The only people who don’t love the NFB are those who haven’t discovered it yet. I grew up on NFB animations shown as fillers in Scotland on TV – and now I’m a frequent visitor to the mediatheque in Toronto … great work! I could not be happier to read these stats. A job well done! Bravo NFB for getting it right and leading the way. Great App too. Would like “the grain elevator” on that list too. Was made down the street from where I grew up. The vast majority of plays to date have been from Canada.